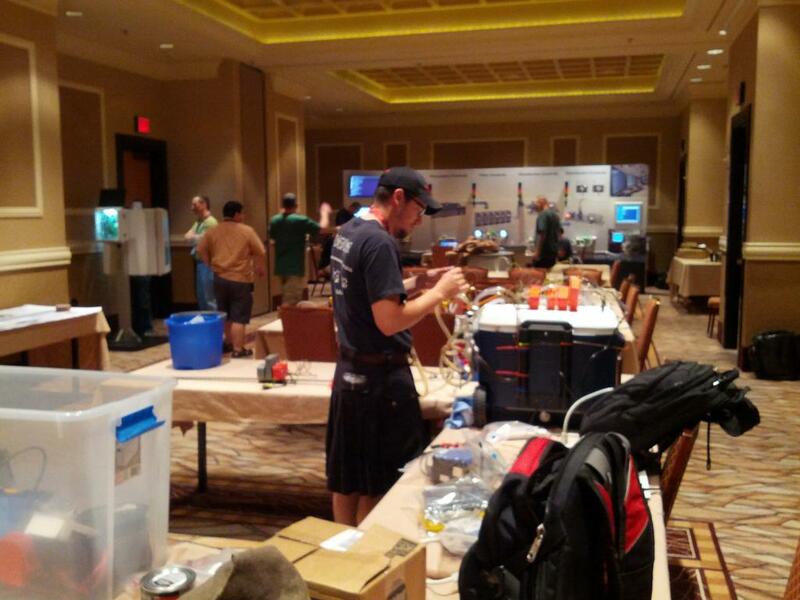 The first ever ICS Village at DEFCON. It featured robotic arms, water treatment buildouts, and homebrew home brewing automation. Our interactive learning approach invites you to get hands on with the equipment to build your skills. We bring you real components such as Programmable Logic Controllers (PLC), Human Machine Interfaces (HMI), Remote Telemetry Units (RTU), actuators, miniature robotic arms, to simulate a realistic environment by using commonly components throughout different industrial sectors. 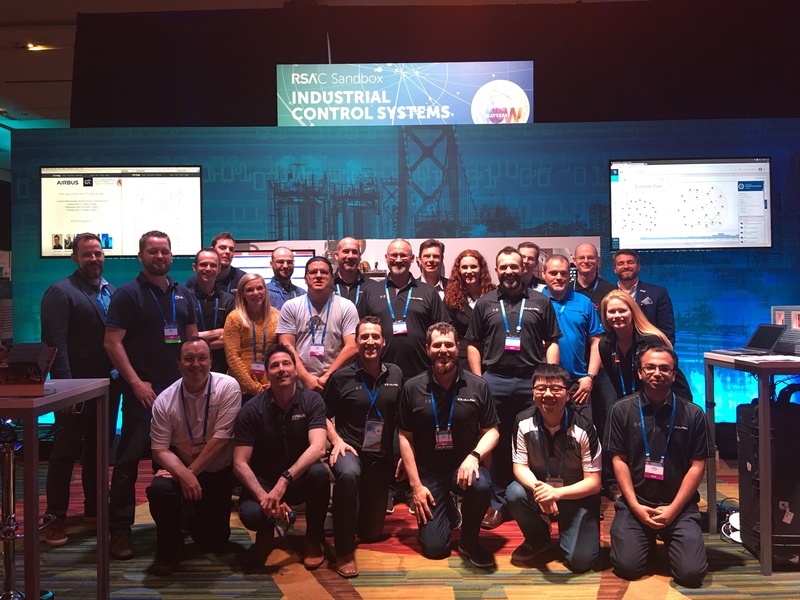 You will be able to connect your machine towards the different industrial components and networks and try to assess these ICS devices with common security scanners, network sniffers to sniff the industrial traffic, and more! Putting together the ICS Village takes a village! Kudos to all these great people for making this years village awesome. Taking a quick tour of the equipment and systems present in the village we see Siemens, ABB, Phoenix Contact, Windows, Linux, IoT devices, firewalls, routers, and more! With all these disparate technologies, how do we have any visibility into what the &@*! is happening on the network? Have no fear, Gravwell is here. Gravwell allows for ingesting, searching, and analyzing logs, network traffic, process events -- we support data of every type. This is of particular importance when dealing with ICS equipment. It's very rare for embedded systems to log data in a consumable way which often means pulling information off of the wire or actively querying a device (which is generally a no-no). Because Gravwell supports binary data, ingesting the control protocols means that a complete "ground truth" record is made searchable. If an attacker targets the process and manages to fool the HMI (a technique seen in the wild), hunting within the ground truth data reveals the treachery. Anyone who has spent time in the ICS space is aware that control system equipment speaks all manner of protocols, some of which are proprietary and not well documented. Gravwell is an extremely powerful analytics engine but we are not an exclusively ICS tool. What I mean is, identifying the make and model of a particular PLC isn't a problem we are attempting to solve. Understanding what a given Modbus coil address on a VFD does isn't our bag. For that, we turn to the experts. Our first integration in the ICS space is with one such expert in this area, Nozomi Networks. The SCADAGuardian tool performs asset inventory, vulnerability assessment, dashboards and reporting, and threat and anomaly detection for ICS by watching network traffic. With this new Gravwell integration, customers of both products can create an OT SOC that provides unparalleled visibility into what's happening on their network AND the process. SCADAGuardian provides the specialized insights for the ICS system which Gravwell ingests alongside the underlying "ground truth" records. Users can then fuse and correlate that data with other system logs such as Windows events, firewall output, or IT information such as phishing alerts. The combined power of Gravwell and SCADAGuardian made it easy to detect and respond to Crossbow attacks launched against the process. Our vision for ICS is to enable a unified SOC that provides COMPLETE visibility into the threats and problems facing an organization. This is on display in the new ICS Village. If you're going to be at one of the events, stop by and hack on some ICS gear to see the setup in action. According to a recent report published by Honeywell, only 37% of organizations continuously monitor plant systems and network activity. Optimistically however, 25% claim they intend to do so within the next year. If you're part of that progressive 25% contact us to learn more about deploying Gravwell in ICS environments.